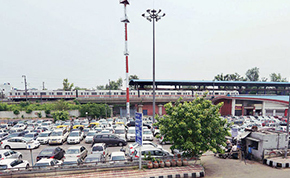 Land earmarked for parking facilities at each of the 21 Metro stations along the 29.7-km Noida-Greater Noida Metro corridor will soon be handed over by the Noida Authority to the Noida Metro Rail Corporation (NMRC). It was also decided that the parking facilities will now be developed by NMRC. Earlier, the Noida and Greater Noida Authorities were to develop the parking spaces besides integrating them with the multimodal transport plan to provide commuters for seamless travel on the Metro. “We have worked out the feasibility and the number of parking spaces to be developed for four-wheelers and two-wheelers,” said Shailendra Bhatia, officer on special duty, NMRC. The plan is to develop some stations into business hubs. These will be holistic in nature and come complete with malls, retail shops, offices, parking area, police post and restaurants.